This is for you, Mom, for all that you do for your horse-loving daughter. This is to say thank you for how you never told your daughter she’d “grow out of it” when she came to you at six years old with wide eyes and dreams of a pony of her own. Thank you for always slowing the car down when you passed horse farms so that she could press herself up against the window to catch a glimpse of the glossy-bodied equines and the brilliant white fencing and that beautiful, entrancing world. This is to say thank you for driving your daughter to the barn every day after school, and for picking her up hours later when it was dark out and dinner was getting cold. Thank you for the days you had to get your shoes muddy and make your way through the barn to fetch your daughter from within her favorite horse’s stall. Thank you for doing this in all weather, and for tolerating the mud and horsehair that she obliviously carried home with her. And thank you for finding a way to make it all work financially. As your daughter grew she learned just how expensive the horse world can be, and she’s come to understand some of the sacrifices that you’ve made. Thank you for understanding her love of riding and for working with her to find ways so that the horse would could become a bit of hers, too. Thank you, Mom, for getting up at 3 am on a Sunday to drive your daughter to the barn for a horse show. And thanks for going back hours later to wait in the sun or the rain for another few hours until her classes began. Thank you for being ringside to photograph and videotape and cheer and, yes, maybe even tear up a little. Thank you for letting your daughter learn of disappointment and hard work and of the fact that the world is unfair. Then, thank you for reminding her that she is lucky and talented and worth more than ribbons. 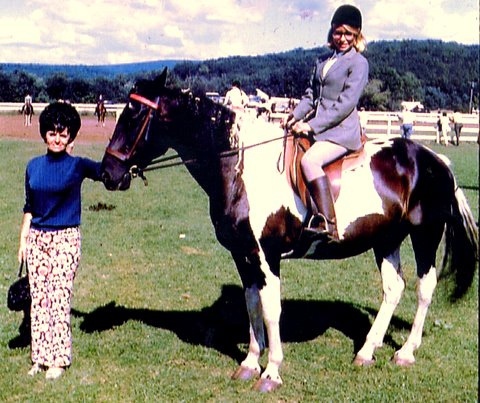 And Mom, thank you for fostering her love of horses – some might call it an obsession. Thanks for understanding how your daughter wouldn’t be herself without horses, and for letting them into your life, too. Thank you for giving her the time, commitment, and support so that she could learn to ride and sit upon an animal which transforms her into a young lady who is graceful, elegant, and proud. She knows you’ve always seen these qualities in her, but sometimes the horse just helps remind her of them, too. Mom, you have given your daughter a great gift. You’ve let her know practice and hard work and tired muscles. Thanks to you she understands responsibility and respect and love. And this will take her far. Thank you, Mom.